If you’re a photographer, you’ve probably heard of Moo business cards. What makes MOO unique, is the ability to print a different image on every card in a pack. What I did not know before placing my first order is that Moo doesn’t just make mini cards. They also offer standard business cards, postcards, sticker books and greeting cards. All with the option of showing off a different photograph on each card! Another great feature that I was not aware of is the fact that I could transfer my selection of images directly from my Smugmug galleries! How much more convenient can it get? I placed an order of Mini Moos featuring some of my travel photography and an order of standard cards with a selection of images of my commercial work and enough space on the back side for my logo and all my contact info. I also discovered a cool decoration (and conversation) piece to display my mini cards: the Mosaic Frame. 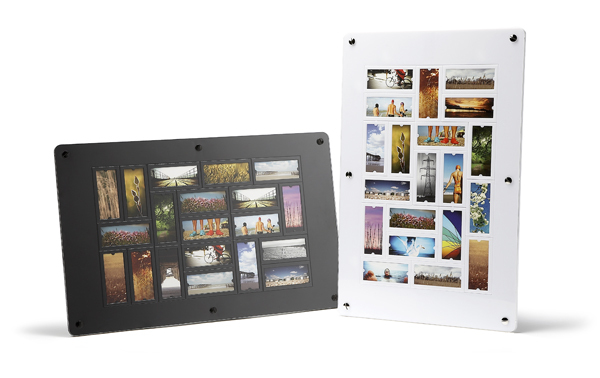 To learn more about the Mosaic Frame ($39.99 USD) click here. Post from: Digital Photography School - Photography Tips. Check out our resources on Portrait Photography Tips, Travel Photography Tips and Understanding Digital Cameras.